This print help page starts with how to download our worksheets. Click on the worksheet icon. It is very helpful with our coloring pages to be able to change the printer settings to booklet or multiple formats. This way you can make greeting and birthday cards using the booklet setting or make your own flash cards using the multiples setting. 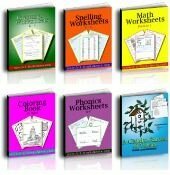 If you've bought our printable worksheets bundles you will be sent an email that has an orange link in it to the zipped files. Click on the orange link. You can print from here. You can also copy, rename, and move the files from here. Printing is easy now. We no longer use free hosting at Adobe for our worksheets! I use our worksheets, too. so I'm glad to make them easy to use. Our printable worksheets are now available to print or save at a click. As above, click on the icon and use Ctrl or Cmd P to download or print the worksheets you like. Now all of our worksheets and coloring pages are interactive. This way, you do not have to print. If your students have access to a computer you can save our printable worksheets to their files and they can edit them. Then you can save the interactive worksheets to the child's file without ever having to print. But on the other hand you can also print - before or after your student does the work. 3) Copy and keep worksheets in order in multiple students' files. 4) Reusable for practice throughout the years.